The Mediterranean Port of Mersin in Turkey is taking an unconventional path — with great success. 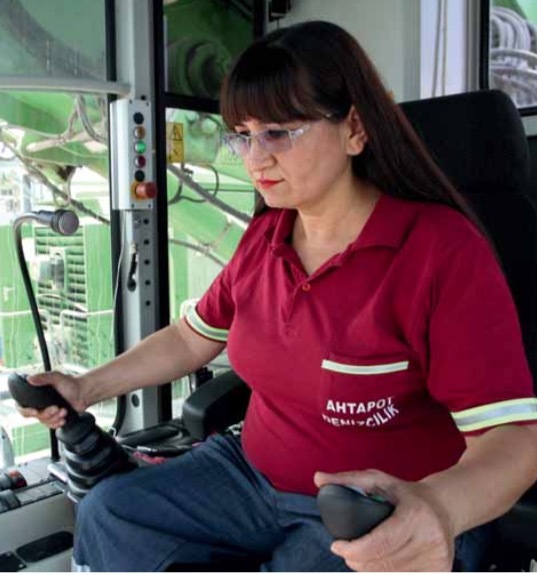 Stevedoring company AHTAPOT Denizcilik handles a variety of scrap for the proprietors of the port using the latest in material handling technology as well as young women to operate the machines. Rehandling capacity is greater than before, and the work climate is continuously improving. Zu¨beyde Pamuk controls the joysticks in the Mastercab with confidence and calm. She is seated 14m above the trucks that continuously deliver bauxite and dump it into containers. She expertly grabs the material and loads it into the 60,000dwt hull of the Julia Oldendorff. In less than a minute, she has finished and signals to the next driver that she needs material faster. The truck driver picks up the pace, since opposing Pamuk is not something he likes to do. A woman who can confidently move a 250-tonne excavator has his respect. The large, green material handler is her favourite machine. It is a SENNEBOGEN 880 EQ with an enormous operating range. A range of 35m and the equipment kinematics allow her to transport scrap to ships such as the Julia Oldendorff. Today, it is bauxite, but with the right grapples, Pamuk and her colleagues handle coal, plaster, grains, wood chips or cement clinker. With the machine, she reaches a handling capacity of 1,500tph (tonnes per hour), reports Erkan Dogan, managing director of Ahtapot. That is more than many men have accomplished. When asked whether or not that made women better operators, Dogan counters that she is not necessarily better, she just works differently. She operates the machine in a more conservative way and is also interested in maintenance and servicing. If servicing takes too long, she wants to know why. “That’s something the men don’t do, and we think it’s good that the women identify so strongly with their machines,” lauded Dogan. The bottom line is that Pamuk and her female colleagues can do a man’s job without difficulty, something that, not too long ago, was not commonplace in many regions of the world. “We need women in these jobs for a lot of reasons. We have grown a lot since our founding in 1999 and now have 1,500 employees.We can’t fall into stereotypes, rather we need well- qualified and motivated employees of both genders,” added Dogan. Pamuk feels most at home up in the machine. “In the beginning, it was like at Universal Studios — the size of the machine seemed unreal. I’ve never operated such a large material handler before.” Since then, the giant machine has become a normal part of life and she would rather have no other job. Inside the pleasantly air-conditioned comfort cab, she has both a comfortable work space and an important job in port handling. What I wanted to know is what is different now than when working with rope machines in the past. She considers the port cranes with rope grapples to be too slow, meaning at best she can achieve only half the handling quantity. She is very satisfied with the hydraulic 880 EQ, since it is both fast and quiet, thanks to the electric drive. She uses the Powerpack on the undercarriage, which provides the machine with power, to take the machine in for servicing. I asked Dogan why the 880 EQ was chosen. “We were promised that our operating costs would be cut virtually in half, and handling capacity considerably increased. And we got both.The machine needs very little maintenance and servicing, thanks to the electric drive. Looking back, today we can say that it was the right decision. The material handler is very reliable and economical,” confirmed Dogan. After eight hours of work, Pamuk climbs down from her machine. She performs a quick check to make sure everything is in order, since she’ll be handing the machine over to one of her colleagues on the next shift, Hu¨zu¨n, Pinar, Bengu¨ or Sena. But she is looking forward to tomorrow, since she enjoys working at the Port of Mersin.